The IBM System x3200 is an entry server that provides advanced availability and management features for remote or distributed locations. Ideal applications include file and print, retail, network infrastructure and distributed applications. 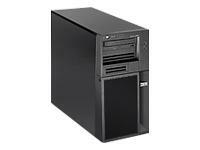 The IBM System x3200 can help lower your IT costs throughout its business lifecycle. The x3200 is not only affordable to purchase, but it's also easy to manage and keep up to date.